The July issue of Bon Appetit featured a recipe for grilled lobster paella that turned me on so much, I immediately ordered a paella pan and a bag of rice. My original plan was to make the dish for Labor Day and invite my dad and brother over to dinner, but as we got closer to the holiday, the forecast called for rain. Rather than forcing Mr Minx to risk getting soaked just so I could try a recipe, I decided that it would be best to cook the paella on the stovetop. Since we had to scrap the whole grilling idea, I also opted to make a more traditional paella with chicken and seafood and save the lobster version for another occasion. I was a bit nervous, as this was my very first paella. 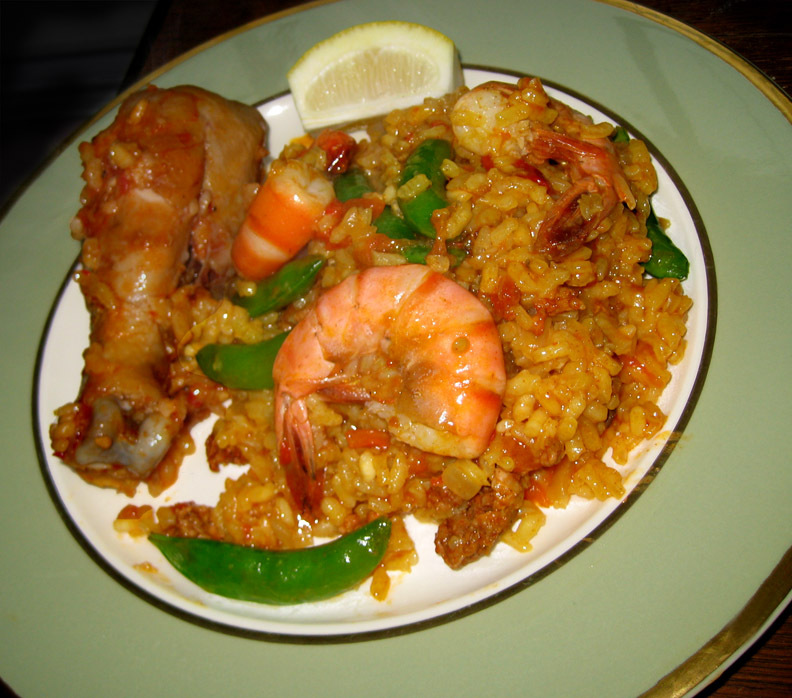 I've only ever eaten it once, in the form of some leftovers from a Tio Pepe Restaurant Week lunch; that paella was simply horrible, but I figured a well-made one had to be better. Prettier, too. I used the recipe that came with my pan, omitting the bivalves and substituting sugar snap peas for regular peas, and was pleasantly surprised at how easy it all was. Basically, one browns chicken in some olive oil, adds chopped onions, garlic, smoked paprika, and soft chorizo to the pan to cook for a bit, and then pours in chicken stock that has been infused with saffron. At that point, any stirring must cease in order for a crust of rice to form on the bottom of the pan. This is called the soccarat, and is the real goal of the paella cook. 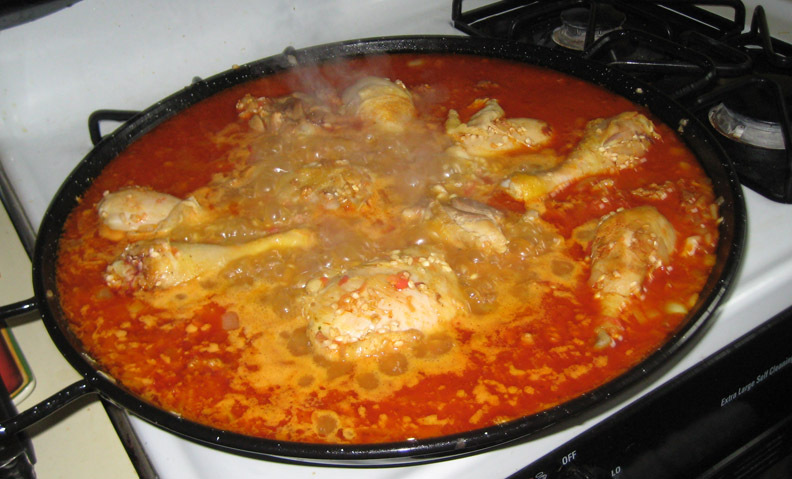 Once most of the stock has been absorbed, shellfish and vegetables can be added to the pan. When the shrimp are pink and bivalves are open, the paella is ready to eat. Seasonings, rice, and stock added and bubbling away. Cooking the chicken was a bit problematic. I had a hard time getting it to brown, and then, even after sitting in bubbling stock for half an hour, it didn't cook all the way through. I'm going to blame this on the fact that I used skin-on, bone-in thighs and legs. Next time, I'll use boneless skinless thighs. 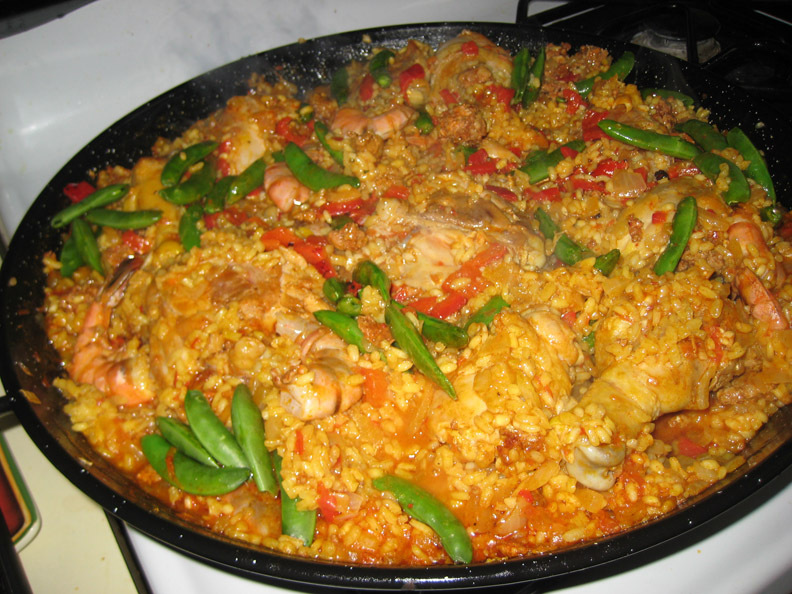 Other than that, the paella was perfect - there was even a bit of soccarat on the bottom - especially with a big squeeze of fresh lemon juice. Everyone had seconds, so it was a hit that will be repeated sometime in the future.